Powers/Abilities: Instant Replay could travel short distances through time. His suit was partly armored although this could've been part of the time travel device that allowed him to make the time jumps. It also possessed two sharp blades attached at each wrist that Instant Replay used to cut through his victims. These blades could also be thrown like daggers. The blades returned to the wrist as soon as Instant Replay made another jump through time. 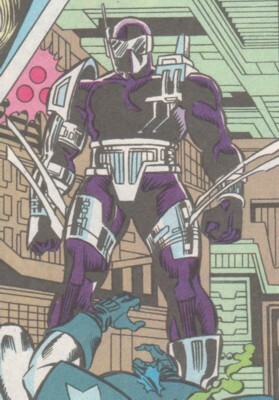 After his first fight against SuperPro, Instant Replay was merged with his armor and the included technology while tumbling through time. Partially he stayed always between his time jumps and he could create duplicates of himself by time jumping many times in a short time. Mutated Instant Replay wasn't able to speak properly anymore (he mixed up the word order in his sentences; example: "Still while run you can"). (NFL SuperPro#2 - BTS) - Sanzionare told his skipper to contact Instant Replay. (NFL SuperPro#3) - Instant Replay trained for his upcoming assassination of SuperPro against a SuperPro robot. He decapitated the robot and Sanzionare was impressed. Instant Replay was then sent to Philadelphia because recent events there involved the NFL and SuperPro was always interested in things involving the NFL. Instant Replay found SuperPro fighting the Eagles Gang and observed him. SuperPro was with the police when they investigated an attack by the Eagles Gang on an Eagles fanshop. Instant Replay found him again and tossed one of his blades at SuperPro. It cut right through SuperPro's shoulderpad. Instant Replay then cut through time itself to appear right behind SuperPro. It worked and Instant Replay repeated his attacks until SuperPro managed to give him an elbow to the ribs when he attempted another attack from behind. Instant Replay fell into the fanshop's destroyed window and his suit somehow got short-circuited (*vrzmm* suggested that electricity was involved). Sparks flew and Instant Replay disappeared again while releasing an agonizing scream. (NFL SuperPro#9) - For some time Instant Replay was torn apart and put back together while tumbling through time. He wanted revenge for all the agony and got his chance when he found SuperPro as Phil Grayfield in Windsor, Connecticut. Phil just tried to talk Coach Rich Henchey into letting his niece Melanie join the school's football team when Instant Replay appeared out of nowhere. Instant Replay used his old tricks, but Grayfield still managed to get to his car and to suit up as SuperPro. Instant Replay and many time displaced replicas surrounded SuperPro, who was too slow for their attacks. SuperPro ran away, but Instant Replay easily followed him and tried to hit SuperPro again when suddenly a football was tossed at him by Melanie. Distracted by this attack SuperPro finally hit one blow that sent Instant Replay into a wall. Replay returned, got kicked by SuperPro and with one punch sent into a powerline above them. SuperPro got him down by breaking the current mast, but Instant Replay fell on the power coils and got fried. Comments: Created by Fabian Nicieza (writer), Jose Delbo (pencils), Charles Barnett (inks). The absence of an origin makes it hard for me to define if Instant Replay was just a technology user, mutate or a living, breathing mutant. My favorite choice would be that he was a technology user because it would make it possible that he had found the remains of the Sidereal Displacer, which was once invented and trashed by Mr. Fantastic, to use it for his suit. 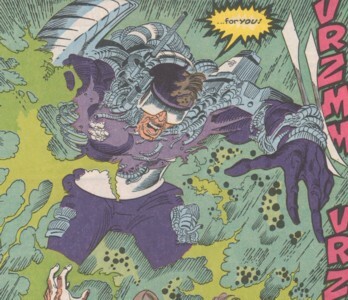 If I'm right about his status as a technology user he was a mutate when he returned in SuperPro#9 because he became one with the suit and the included time travel device. It seemed like Instant Replay died in his last appearance, but it would be easy to return him to life. I can already picture his return in Thunderbolts or Cable & Deadpool. IMHO Instant Replay was the coolest idea in this series with the worst name possible. It's like he was created to face SuperPro which is the case, but if you look at this guy like he is a real person the naming is retarded. He seemingly lived for the day to fight a football themed hero like Greyfield. This guy had a reason to hate SuperPro and he knew his secret identity (who didn't?). Again SuperPro couldn't get the job done on his own and this time his young niece had to help him.